Newspaper WordPress Theme Review: Is it right for you? Newspaper is a beautiful news theme created by tagDiv, an Envato Power Elite author, with the publishing industry in mind. Built to handle large amounts of content, Newspaper features a bold and elegant design combined with the power of versatility. Furthermore, Dedicated to making the website look professional, Newspaper is a must-have template for both beginners and advanced WordPress users. Find all the essential details in a comprehensive Newspaper WordPress Theme Review. 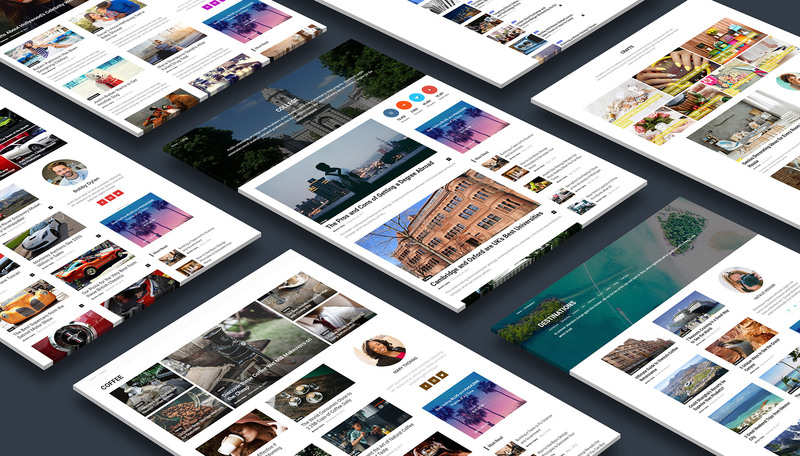 Newspaper by tagDiv is the best-selling WordPress news theme of all time on the Envato ThemeForest Market. Why? Because you don’t have to be a web designer to create a beautiful news website. With a clean, and stylish architecture, Newspaper is an impressive and one-of-a-kind theme for magazine sites. Designed with your audience in mind, this responsive & retina ready template offers you a multitude of options for small screen devices. Newspaper allows you to choose how your content displays on the desktop, mobile, and tablets. Whether you want to take the time to enjoy building your new site from scratch or redesign the website with the speed of light, the Newspaper template is an excellent choice. 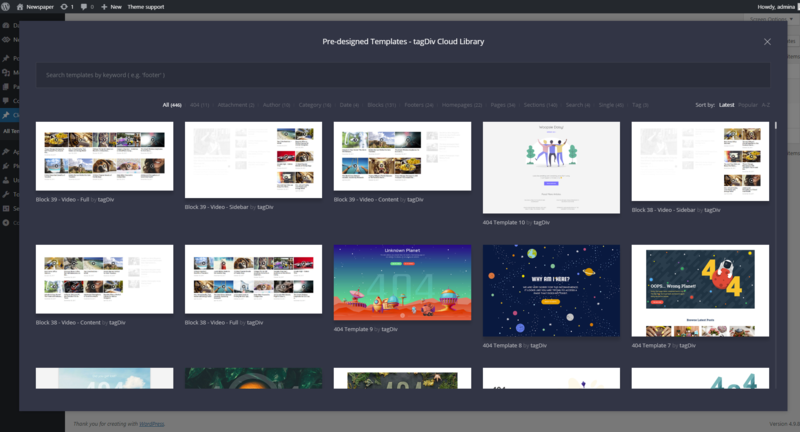 It comes with over 67 amazing pre-made demo designs, and a gallery of 620+ already built design templates, called tagDiv Cloud Library. The Newspaper WordPress Theme saves you from the hassle of searching and testing to find the right design. It comes with dozens of pre-built sites you can choose from. Newspaper brings you a custom importing system, so you can preview a demo and install it with a simple click. You can also load the demo with content or just the design. If you decide to uninstall it, the import system clears the website of any demo elements, leaving your pages just like they were before. Newspaper gives you the perfect balance between the elements used on a page. It brings you a frontend page builder, called tagDiv Composer. Light and fast, this tool helps you edit your pages just by dragging and dropping elements where your heart desires. To make everything even easier, you can create complex CSS customization with only a few clicks. Arranging and styling each element is now a piece of cake. You don’t need any coding skills to make your dream come true. With this powerful tool, you can build astonishing pages. Newspaper Theme comes with 22 multipurpose shortcodes you can use to create landing pages, presentation and business websites. tagDiv Composer makes your site an infinite playground where you can test your ideas, challenging your creativity. The latest version of the Newspaper theme brings you a new way to create articles on the frontend with the tagDiv Composer page builder. The tagDiv developers also offer you a quick way to create content using elements designed by the professionals. 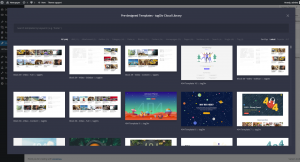 Over 620 elements, layouts, sections, headers, footers, and homepages are waiting for you in the tagDiv Cloud Library. Just click a single post, 404, author, category, fancy footer or search page, then import the ones you like from the tagDiv servers. To access this section, you, first, need to register your theme license. I’ve written at the beginning of this Newspaper WordPress theme review that it’s designed with the publishing industry in mind. However, what does this mean? With Newspaper theme, you have no constraints on creating your content. In the tagDiv Cloud Library, you have 56 single templates. For those who don’t know, a single template refers to the post layouts. So, you have 56 designs created by professionals and an additional blank one you can use to build your own from the ground up. Each template is fully customizable as you can edit it with tagDiv Composer page builder to add or remove elements. Furthermore, the page builder brings you 10 shortcodes you can use only on posts to customize everything. Even more, Newspaper theme comes with a neat header builder, packed inside the tagDiv Composer. I would only tell that you can create different headers and menus for mobile and small screens devices. 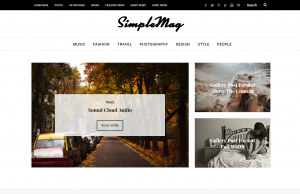 The theme gives you a myriad of elements and shortcodes, countless big grid style combinations, ready-made category page templates, and 25 predefined blocks. There are also five Flex Block elements that bring extra flexibility and lets you publish articles without constraints, and can be highly customized. You can emphasize the Above the fold area by using Big Grids displayed in full-width size. Custom built features like the image slider gallery, images lightbox effect, social counter, news ticker, video playlists, weather and exchange widgets, give your website a professional touch. A great way to attract visitors is to harness the power of typography on your pages. Newspaper opens new perspectives with Google, Adobe Typekit or Custom Fonts, giving you the tools to enchant the visitor’s attention. The tagDiv Composer has recently introduced a Fonts Style tab that lets you create custom typography for every block or element present. You can combine beautiful fonts, size, or line height. Thus, the process is natural, without involving code knowledge, or additional font customization plugins to slow down your website’s performance. Another helpful tool is the Translation Panel, which helps you load one of the dozens of translations available and automatically convert a list of strings. tagDiv also implemented a modern ad system that allows you to generate revenue from advertisements without downgrading the reader’s experience. You can easily monetize your website with 18 ad spots, ready to be used in the header, footer, article, smart list, and sidebar areas. Moreover, the Newspaper theme comes with an option to show ads on individual posts or pages, using the tagDiv Composer page builder and the Single Post Content or Ad Box elements. You can use AdSense or HTML code. Above all, the options, settings, plugins, demos, and website monitoring systems are gathered in a single place, the Newspaper Theme Panel. Neatly, clear and intuitively organized, all the theme’s options are straightforward to use. With this in mind, I’ll write a few thoughts on the tagDiv’s page builder – tagDiv Composer. It is crafted for blogs, news, and magazine websites, giving you a unique way to build pages, posts, and headers. Moreover, you can see the results in real time, and that makes it a powerful tool. The tagDiv Composer is a highly optimized plugin that gives you performance and reliability. Even more flexible and versatile, Newspaper incorporates multi-purpose elements that let you build creative landing pages for your business. There’s a section into the tagDiv Composer page builder where you can find the new multipurpose shortcodes. Moreover, you can mix rows and get the visual appeal you’re seeking for. There’s a library of 22 new content elements that you can find within the tagDiv Composer plugin. From custom and reusable templates, one-page functionality, to image & video parallax, gradient colors, and everything in between, Newspaper has got you covered. The theme brings you eight premium plugins: tagDiv Composer, tagDiv Cloud Library, Social Counter, tagDiv Mobile Theme, and tagDiv Newsletter. 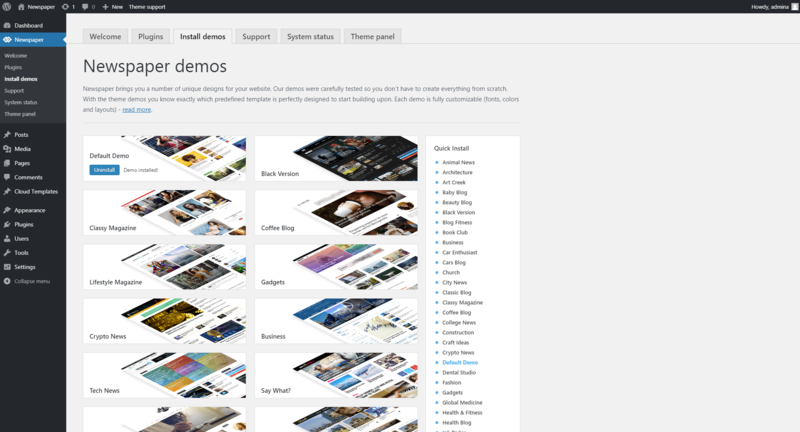 Also, the theme is bundled with the Revolution Slider and Visual Composer plugins. With the Newsletter Plugin, you can keep your audience up to date. It comes with over eight beautiful designs so that you can adapt it to your website appearance. The tagDiv Newsletter plugin is compatible with MailChimp, Mailerlite, and Feedburner campaign providers. Furthermore, the theme was tested with the WP Super Cache, Contact Form 7, bbPress, BuddyPress, Font Awesome 4 Menus, Jetpack, WooCommerce, SEO by Yoast and WP User Avatar plugins. Newspaper also comes with a custom plugin to help you show off your social networks stats – the tagDiv Social Counter plugin. You also have two unique social image widgets (Instagram and Pinterest). Besides, the tagDiv author created 35 custom widgets, which you can easily drag into your website to highlight the essential. Newspaper is AMP ready. The functionality is already integrated into the Mobile theme plugin for faster results so that you can benefit from all of the mobile theme functionality on your AMP pages. In addition to this, the theme raises the standards on page loading speed and mobile optimization. We have tested the Newspaper default demo on different page speed tests, and it loads the content at high speed. Furthermore, this theme has extensive documentation with a search option and video tutorials. It helps you achieve performance and optimize your website. 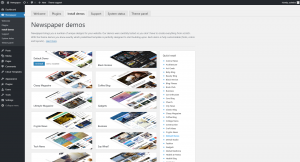 Newspaper theme has a multitude of available settings allowing users to customize almost every element and section of the template. However, this diversity can be overwhelming for WordPress beginners. It may take you a bit to get used to the theme’s way of giving you access to customization settings. But, once you do… Well, you’ll know what I mean. Newspaper Theme has no RTL support. These days, having a beautifully designed website and cool features is just not enough. Your website visitors want a top-notch experience: your site needs to load the information quickly. In this Newspaper WordPress Theme Review, I've shown you how to create fast websites and unique looking pages & posts, each with a custom layout. 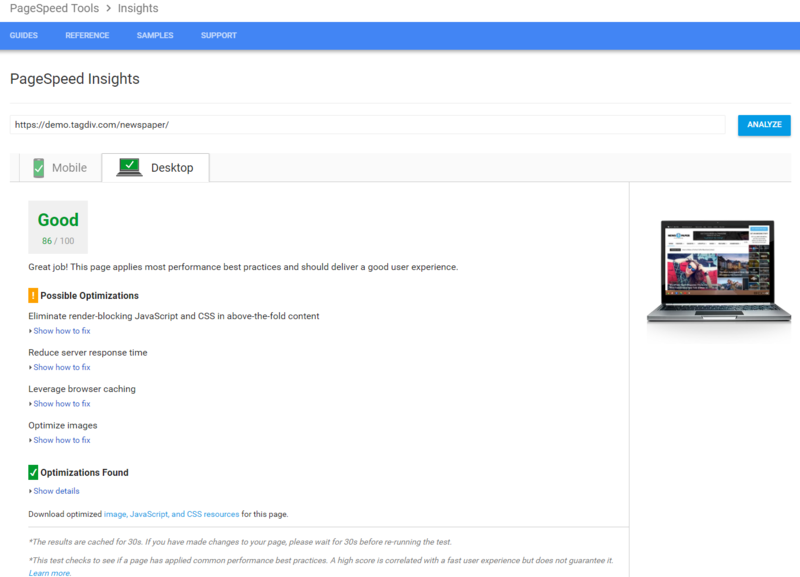 This is a high performant and versatile news, blog, reviews, and magazine theme. In conclusion, with the functionality of a multi-purpose theme, Newspaper is one of the best on the market. It is designed to power up your website and keep the visitors coming back for more. Hello team, Newspaper is beautiful and easy to use, and the article comes in handy. But I would like to implement the infinite scrolling on single posts. Can you name a plugin that could work? Hello, Jessica! We have tested the theme and the custom features that come bundled with it and we realized that the Newspaper theme has a built-in infinite scroll pagination for blocks and page templates without an infinite load for posts. You can try some plugins from the WordPress repository or from https://codecanyon.net/category/wordpress . Good article. . Help me decide between newspaper, Trumag and…. if you know anything about Trupixel? Can I link a post form the Newspaper theme to another site such as Facebook? -My website will be in spanish: is it possible to translate the name of the content categories and all the features? I mean, will there be things that remain in english? -As it will be a magazine type of website, can I customise exactly how many categories I want displayed on the home page? If i need 7 and only 7 -music, movies, theater, tech, fashion, tv and bussiness- can I have that many, no less, no more? Thank you for your trust and kind words! Yes, Newspaper has a great Translation Panel right from the Theme Options that allows you to translate all the specific elements of the template. You can check out the theme’s official tutorial: https://goo.gl/Y42Ful. On your site’s homepage, you can display as many categories as you want since there’s no limit. Two words: astonishing & fast!! Hi, Ludmila! Thank you for your kind words! Hi, Victoria! Thank you for sharing your amazing experience with the Newspaper 8! Thank you for the review. I wasn’t sure if Newspaper is the theme for me. I’m going to buy it ASAP. :)) Thanks for this. Thank you for feedback. I’m glad you liked the review. We are testing each theme to give you all the information you need before starting to build your website. How are you guys? I love this theme! Where can I buy it? Hi, Erick! Thanks for the appreciation! For you to purchase this theme, there is an “OFFICIAL PAGE” button that will send you directly to the page where you can buy the product. Have a nice day and good luck building your website! Hi. I love all your reviews. Can you make in the future a review of the TechWise theme? It looks so good! Dear Christie, every theme comes with detailed information about installation and configuration after the purchase. Choose the theme that inspires you, purchase it and all the details will come along! Very very nice review – I have been using for a years theme sahifa – but I am not satisfied with this theme on the mobile devices – then I decided to change it to something else and better and I found your review. Now I think that I found much more better theme and I will buy newspaper. Still I have to decide which one will be better for me if Newsmag or Newspaper. But I will buy one of them for a sure. Thank you for reaching out to share your experience with us and our readers. Good luck with your project! I want to buy a theme for my product review website now, I have to choose between Newspaper and Wordx. Thank you for the given trust and your appreciation! 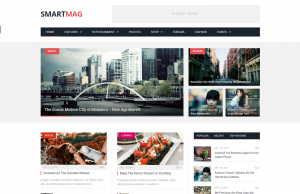 Newspaper is definitely a fast and constantly updated WordPress theme. It has a clean code and high-quality features that can get your website where you want it. Usually, we review templates from the Themeforest market, and the WordX theme is sold through another platform. Though, thank you for suggesting it for future deep-analysis! Good luck with your project! Keep us posted. Hi, I wanted to understand if this theme can be used for any of the Indian languages. Also, which is better – Newspaper or Publisher ? Hi! You can use it for sure for your website. This only depends whether you refer to an Indian language that uses left-to-right writing or right-to-left one as the Newspaper theme doesn’t have RTL support implemented. 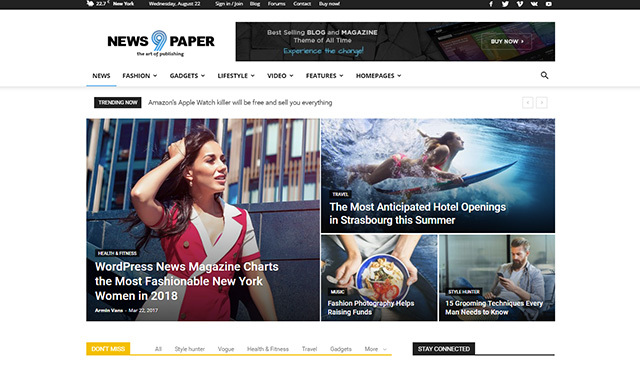 Newspaper is a great theme and comes bundled with amazing features – please check out the official page here https://themeforest.net/item/newspaper/5489609. The Publisher theme (which is not a product from the tagDiv author) is no longer available, and it was pulled off the Envato market. I hope you’ll find this information useful! I appreciate your article, but please which do I go for between Newspaper and Soledad? Hi! Thank you for the given trust. Both themes are great, though the Newspaper template comes bundled with premium and amazing new features that can help you configure your blog, news or magazine website with ease, with no coding knowledge. Any modification is happening live on the frontend of your site by using the tagDiv Composer which is the first handcrafted page builder for the news industry, and its dedicated elements. Please click the official page to find more information on the latest features – https://themeforest.net/item/newspaper/5489609. It all depends on what kind of website you would like to create, and if you desire to do everything quickly, just by using a few clicks. Good luck with your project! Thank you for the review. You wrote a good review about Newspaper theme. Thank you for your kind words about our review :). Thank you for review. This is my next theme for my rebranded website. 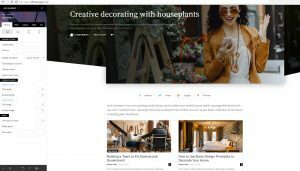 I want to use Newspaper 9.2 Theme on Different Blogs is it possible? The Newspaper Theme is exclusively sold on Envato Market, and due to their policy, you can use a license for a single website. I love theme Newspaper. It’s so friendly with users!